This morning, we woke later than we intended, yet nevertheless managed to pack our suitcases, shower, check-out, and eat breakfast, all before the free walking tour was scheduled to start. Of course, everything is on Portugal time and we ended up waiting for half an hour, only to be told by the hostel staff that while we were waiting, the walking tour guide must have missed us and left without us just five minutes prior. We were told that if we hurried we could still catch up with the group at a nearby subway station, so we dashed out of the hostel and quickly made our way to the meeting point. Thankfully, we saw the tell-tale guides with their yellow shirts and ran up to the group, relieved we had not missed it after all. Our guide was a young and energetic history and art major who has a clear passion for Lisbon and all of its intricate cultural and historical influences. She took us on a tour of the Mouraria neighbourhood. This is another of Lisbon's oldest neighbourhoods. Historically, even before the earthquake, it was where all the "non-Christians" lived - the Jews, the heretics, the prostitutes. To this day, it remains a vibrant multi-cultural hub for people from all over the world - India, Pakistan, China, Africa - and our guide excitedly described to us her favourite markets to go to, spots to hang out with friends and grab drinks, as well as pointed out all the interesting architecture, the unique and quirky features of the very small and narrow homes that have been standing for hundreds of years, showing us a hidden palace, and taking us to some of the area's most interesting street art along the way. Something in her passion and excitement for this vibrant mosaic of cultures, peoples, and histories all layered over each other in beautiful and unpredictable ways gave me a fresh perspective on what it means to be a young person from Portugal today. Like the woman in the bookstore in Porto who passionately took me around and showed me all her favourite writers, I felt another sort of connection to this girl who was our tour guide. A reflection of myself, in a way, for I am just as passionate about all the neighbourhoods and layers of culture and history in Toronto as she clearly is about Lisbon. For there are two Portugals for me - the one of my parents' youth, which they carry with them always and remains alive in their hearts, unchanged, despite the impossibility of them ever finding it again; and the current, modern Portugal, which neither my parents nor I really know. This trip was a taste of it - I saw so many parts of the country I had never seen; that my parents, or even our passionate tourguide had never seen. I flowed among the different places and peoples, never quite belonging as either a local or a foreigner. One foot in each world, I still feel the internal struggle to understand myself as part of some larger whole of this culture, and figure out what it really means to me. It's an on-going journey, and I know I'll be back many times still. As our tour ends at one of our guide's favourite viewpoints over the whole city, with the castle clearly visible in front of us, I feel a deep sense of calm. Usually when I leave a country it feels very bittersweet, for I never know if or when I'll return. In the case of Portugal, it will forever belong to me in some way, and I know the ties I have will inevitably keep pulling me back over my lifetime. It's a temporary farewell. Portugal surprised me. The variety of landscapes and expressions of humanity and the natural world packed into such a small country was fascinating - mountain ranges, wild horses, bustling cities, multi cultural neighbourhoods, people living in ancient stone houses, endless flat fields of olive and cork trees, ruins left by peoples who have spanned centuries, monuments, breathtaking limestone caves and beaches, wild waves, rugged coastlines, boulder-strewn hills, lush waterfalls, gut-wrenching performances of fado, decadent wines and cheeses and fruits, ancient libraries and universities, street festivals; old and new, wild and human, living side-by-side in an intricate balance... it was if I visited a thousand countries, a thousand peoples. I'll end this final post with a poem I wrote three years ago, after the last time I went. Even though I learned and saw and felt and experienced more about this country than I ever knew, the words still vividly capture the emotions I feel when I am here. Adeus, Portugal. Até a próxima. Last night, we arrived in Lisbon and safely returned our car to the rental place in order to spend two days in Lisbon without it. My uncle welcomed us to "The country of roundabouts" when we first arrived, and he couldn't have been more right. Despite his very detailed instructions when we first arrived in the village, we still had more than one time where we exited at the wrong place and had to circle back around or take highly detailed and unnecessary tours through neighbouring towns. We eventually got the hang of roundabouts in small towns (the ones in major cities were still quite terrifying - double lanes and traffic lights! ), and figured out the other idiosyncrasies of driving in rural Portugal. (For example, their yellow lights repetitively flash at you rather than hold steady. Sometimes, that means "slow down, prepare to stop," but other times it can change from red back to flashing yellow, meaning "there's a pedestrian crossing here or some other unknown reason you should be cautious". And other times, according to my uncle, it means "the traffic light is in a controlled speed zone that will immediately change to red if you go too fast, but if it's malfunctioning it will just flash yellow indefinitely so you can go through it anyway." Windy mountain roads, roundabouts, flashing lights, rural road construction zones, tight parking spaces, and 2100km later, we nevertheless made it safely from top of the country to bottom and back again. Free of our vehicle, we set out to explore as many of Lisbon's hidden nooks and charms as we could, while also hitting some of the most famous historic spots. Our first stop was the neighbourhood of Belém. It is here that Portuguese navigators set off in their ships during the age of discoveries, following the river Tagus (Tejo) out to the sea and to unknown lands. The tower of Belém was built in 1515 as an important fortress to guard Lisbon's harbours. We waited in the line to go inside, and while we were waiting admired the twisted, intricate stonework detail and the arched windows, balconies, and domes that dominate the Portuguese-unique "Manueline" style of architecture. The top (after climbing 93 stairs) gave us great views over the city and the river Tagus, and I sat in some of the smaller turrets, trying to imagine what it must have been like to look out these windows long ago and keep watch over the harbour. The other major monument in the area is across the street - Monastery of Jeronimos. It was built in 1502, again in the Portuguese-exclusive "Manueline style". Vasco da Gama, the famous Portuguese explorer, came here to pray on the evening before what ended up being the first successful sea voyage to India. This impressive feat of discovering the maritime route to India gave Portugal a monopoly over the very lucrative spice trade for the next 100 years. His tomb is located at the front of this monastery, and so is that of Luis de Camões, one of Portugal's most famous poets from that same time period. crazy enough (or both) to leave everything you know behind and set off into the unknown. Perhaps I inherited my wanderlust, passed down through generations of ancient explorers. 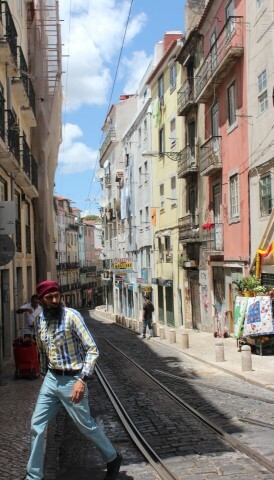 Lisbon is alive with history, and I am immersed in it. I look out at the river, and imagine tall ships with unfurled sails, slowly sailing away. Somehow, in my mind's eye, part of me is with them, off in search of unknown shores. After our history-filled morning, we walk over to the oldest pastel de nata shop in Lisbon - Pasteis de Belém. Using a secret recipe that dates back to 1837, they make the tarts by hand, using traditional methods, and sell thousands of them each day. J is a pastel connoisseur at this point, and we of course must try these, so we join the line (which thankfully isn't too long) and get 8 of them to go. We head across the street to a park and sit in the sun, eating the deliciously flaky and nutty crusts filled with creamy sweet custard. It's hard to decide which of all the pasteis we've eaten is the best, but this one is definitely up near the top. Next stop is a ride on the historic 1930's electric tram. These vintage vehicles are still in use along one of Lisbon's main routes through the city, as they are the only ones that can navigate the steep and narrow roads of Lisbon's old quarters. The wood paneling and seats inside are very 1930's indeed, as is the rickety, jerky feeling of climbing those steep hills in a vehicle that's almost 90 years old, as you watch the driver turn a metal crank and perform almost a dance of coordination with his different cranks, wheels, and dials. Large parts of Lisbon were destroyed in a massive disaster that occurred in 1775 - an earthquake who's epicenter reigistered at 8.7. Because it happened on a holiday, the Day of All Saints, everyone was in churches that morning, and every space in every building was covered in lit candles. This caused the second disaster of the day - as people were trying to recover from the massive earthquake, Lisbon was now on fire from all the candles which had fallen over. Then came the aftershocks of the earthquake in the form of huge tsunami waves that covered the city. This massive tragedy destroyed much of Lisbon's old monuments, neighbourhoods, and historic documents. Much of Portugal's history, poetry, and music was lost. Thankfully, a few neighbourhoods were spared, like Alfama, and that is the area we rode the tram through. The narrow streets, very old buildings with unique doors, windows, railings, and colours were quite fascinating to look at as we rode up and down the streets. After this, we decided to go back to our hostel and rest for a short while before heading out to experience Fado. Fado is a unique musical style that was born in Lisbon. This passionate, often melancholy, heart-wrenching music is said to be the soul of the Portuguese people, and we were eager to hear it performed live in its natural element. We found a small bar called A Tasca do Chico, and hesitantly made our way in to the very crowded space. There was no more sitting room, so we ordered a pair of sangrias and stood against a wall, waiting for something to happen. Soon enough, the lights were dimmed, the doors to the outside were closed, and a young man went to the middle of the small space. The sounds of the Portuguese 12-stringed guitar filled the air from his masterful accompanist, and the voice that came out of him immediately grabbed our full attention. 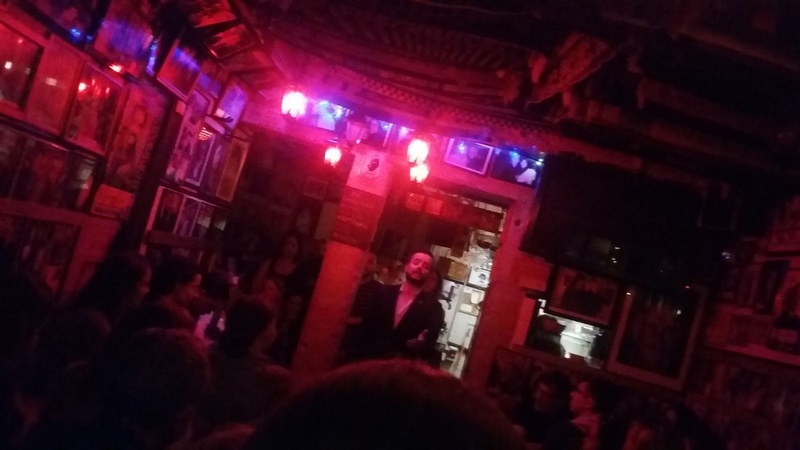 Fado is not something that can be described; it can only be experienced. There was a quote on the wall saying that you are a 'fadista' not only if you sing fado, but also if you know how to listen to fado. And listen we did, hearts attentive to every quiet phrase that suddenly swelled into passionate melancholic longing. Poetry spilled from his skillful story-telling, and he sang mostly head down or turned away, and eyes closed, clearly lost in his own turmoil of emotions, channeling them for us through song so that we could all somehow have a joint experience of longing, saudade, grief, hope, secrets, joy. Fado is not just 'sad music'. It is the soul, given voice. We stayed there for a little over an hour, as three other singers took turns going up and giving us their own versions of fado. Old and young, men and women - it was a beautiful evening in the heart of Lisbon's culture, and we soaked up every moment of it. Around midnight we left the Fado bar and wandered the streets of Lisbon's Bairro Alto neighbourhood - where the famed night-life happens. Things don't really get started in Lisbon until at least midnight, and we were surprised at how the streets had filled up with people drinking, eating, and laughing. Drinking in the streets is legal in Portugal, and alcohol is cheap (think 1 Euro beers), and clearly the night life crowd knows how to party. 2 am is when things really start happening, though, but our travel-weary selves only made it until about 1:30 before we decided to call it a night. Lisboa de mil amores... thank you for showing me at least some of your secrets.